Product code: ES8350 Categories: Sold Items, Sold Jewellery. Perfect for day or night this antique garnet and diamond bangle made in 1899 sits perfectly on the wrist and is perfect to wear for any occasion. 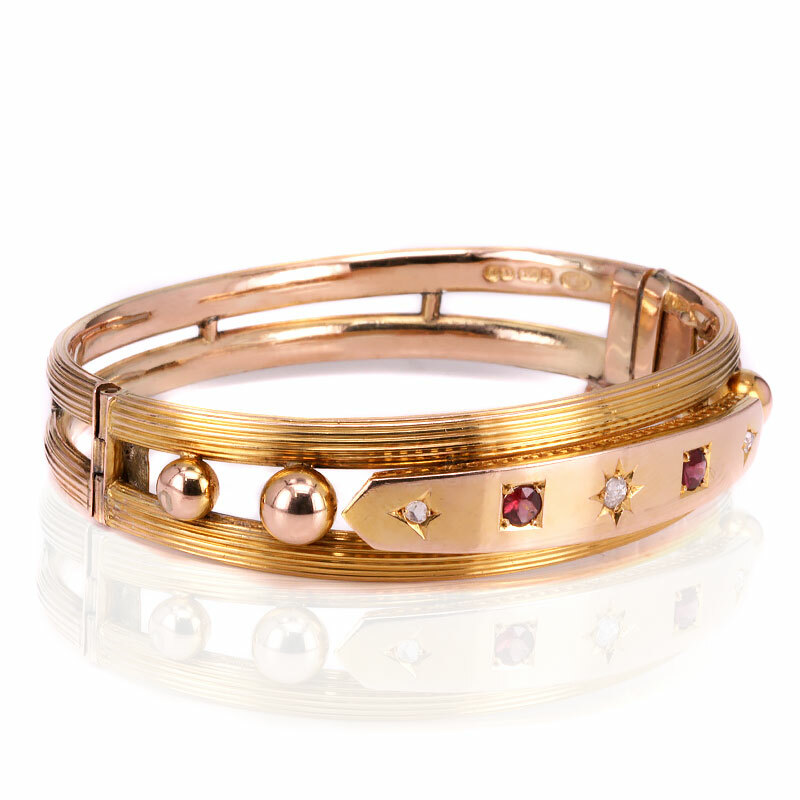 Made in 9 carat rose gold, the bangle is set with a European cut diamond in the centre with a garnet on each side, followed by a rose cut diamond at each end. The diamonds come together to total 0.12 carats and the garnets 0.48 carats, and typical of antique jewellery made in the late Victorian period, the diamonds have a lovely star pattern around the diamonds also known as gypsy setting. This little feature adds that extra element of character that will always be admired when you look at it up close on your wrist. Measuring 14.8mm wide at the top section and then tapering down to 9.5mm wide at the back, the bangle in hinged that will allow it to sit nice and close to the wrist and is fitted with a safety chain for added security. This lovely bangle is just perfect for any occasion and is still in wonderful condition 120 years after being made.